Allen Iverson, talking about practice. 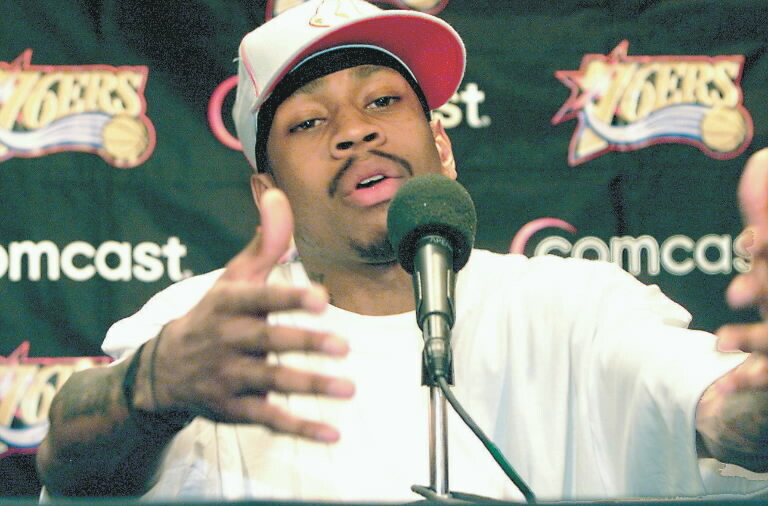 Ten years ago, on this day in May, Allen Iverson, who at the time was the Philadelphia 76ers’ star guard made the words “practice” famous. Practice: the action or process of performing or doing something as it’s defined according to dictionary.com had a different meaning on that afternoon in May. Sitting in front of several media groups and cameras, Iverson who was holding a press conference due to missing a practice, single handily changed the word. 13 sentences, 193 words, and point guard, Allen Iverson changed the word of practice. Oh yes, I’m talking about the word practice. “Now I know that I’m supposed to lead by example and all that, but I’m not shoving that aside like it don’t mean anything. The next day, following his practice comments, Iverson would back it up that it was just “practice” as he scored 31 points, had 7 assists, and 3 steals in the 76ers 104-97 loss to the Detroit Pistons. As for the 76ers they would go onto lose the series, 4-2 to Detroit. However, they wouldn’t lose Iverson’s famous comments as the story ten years later, wasn’t that the Pistons went on to defeat the 76ers, it was that Iverson re-invented the word, practice.